We wanted to demonstrate our love and support to valued Challenge member, Vanessa Pritchard and her triplet sister Amanda, who were both recently diagnosed with Motor Neurone Disease (MND). They lost their other triplet Emma three years ago and sadly last year, they also lost their mum to this horrid disease. Our enthusiastic creative Challenge community rallied around our idea to help us run a highly successful Art Sale donating 72 art pieces for sale. ALL monies raised were donated directly to MND NSW for MND Research. An event like this, doesn't just 'happen' and I would like to thank some very important people, key to helping it be so successful. Firstly, thank you Vanessa and Amanda, who allowed us to share their journey of diagnosis and living with MND and for encouraging us to raise funds for MND research. No-one should have to suffer from MND - not ever. Joanne Stead - Thank you for the excessive time and effort that you put in to make this Art Sale happen. I know that MND has touched your life in many ways and your generosity and commitment to orchestrating this fundraiser is so wonderful. There was a lot of 'behind the scenes' work that made this fundraiser such a success and I personally am so grateful for all you did to make it happen. MND NSW - thank you Kym and Penny for joining forces with us and for setting up a specific shop for the Challenge Art Sale on MND NSW website. Lastly, thank you to our amazing 52-Week Illustration Challenge community. 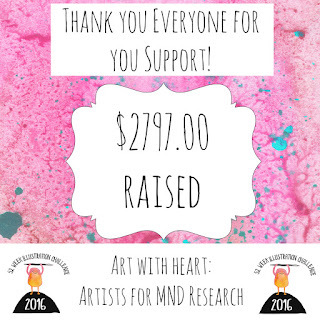 I am honoured to have had SO many artists agreed to be part of the Art Sale Fundraiser (72 artworks were donated), and it is solely because of this generosity that we are delighted to announce that we have contributed $2797.00 to MND Research.